The Bulls assigned a pair of rehabilitating veterans to their G League affiliate, K.C. Johnson of the Chicago Tribune tweets. Nikola Mirotic worked out with the Windy City team while Zach LaVine had an individual workout. The Celtics have recalled forward Guerschon Yabusele from their G League affiliate, the team’s official site relays. Yabusele put up 27 points in his most recent game for the Maine Red Claws. The Magic recalled rookie Wesley Iwundu from their G League affiliate in Lakeland, Josh Robbins of the Orlando Sentinel tweets. Iwundu has averaged 17.6 points in seven games with the minor league squad this season. The Clippers are in a precarious position, now teetering on the ledge of an existential crisis following Blake Griffin‘s latest significant injury. Suddenly, the team that seemed so valiantly intent on forging ahead without Chris Paul (and then Milos Teodosic and then Patrick Beverley) has been dramatically deflated, dealt a seemingly insurmountable blow that could very well change the franchise’s short-term plans. Needless to say, the next few months will be of particular interest to various representatives of the team’s pending free agents, several of whom could stand to benefit from increased playing time in Griffin’s absence and/or a significantly expanded role if the team decides to lean into a full-fledged rebuild and trade away veterans. On paper, the Clippers could end up with substantial cap space, but that’s far from guaranteed considering how many players have options heading into the summer. One of the biggest potential beneficiaries of the Clippers’ bad luck is Harrell, a 2015 second-round pick who showed glimpses of productivity throughout his first two seasons in the league with Houston. Harrell hasn’t done much to this point in the 2017/18 season but it seems inevitable that he’ll see his playing time and opportunities in general increase over the next two months. While the absence of Griffin could open up opportunities for Johnson to see more of a role at the big league level, the team would have to fully accept a rebuild in order for the sparsely-used North Carolina product to start seeing consistent action. I’m not sure if the Clips are there yet. Simply put, Johnson hasn’t show much in Los Angeles and the team forfeited the chance to lock him up on the cheap last month when it turned down his rookie option. After eight underwhelming seasons in the NBA, it’s hard to imagine Johnson landing big money in a crowded free agent market next summer. However, the 30-year-old – who has career averages of 7.6 points and 3.7 rebounds per game – has a player option worth over $6MM that he’ll presumably accept. Jordan is the closest thing to a marquee name among Los Angeles’ pending free agents. The 29-year-old will be coming off of seven straight seasons as a rain-or-shine starter (10 in total), with off-the-charts rebounding numbers and an All-Star Game under his belt. That being said, Jordan – who holds a $24MM player option for next season – will need to be careful heading into the summer, considering the market for big men has changed since he signed his last contract. On top of that, any long-term deal would put a club at risk of having that contract turn into an albatross during its back half. Finally, it’s not inconceivable to suggest that the Jordan you could temporarily (kinda, maybe, possibly) justify maxing out was simply a product of CP3’s playmaking abilities. Jordan may very well end up turning down his player option, but there won’t likely be strong market pressure for L.A. or anybody else to offer a huge long-term deal. Now with his third team in three NBA season, Reed will need to show that he’s more than just a journeyman spot starter with legal baggage. While Reed has been used less with the Clippers than he was in Miami last season, his opportunities could increase substantially with Griffin sidelined. I suspect, given the big man’s per-36 numbers, he’ll be able to procure more than the minimum and stick with that team for longer than a single season. The Clippers took a gamble on Rivers in 2016, offering the largely unproven combo guard a major contract without much of a track record to show for it. Fast forward two seasons and Rivers remains more or less equally underwhelming. Rivers does little across the board and isn’t a particularly effective shooter. It wouldn’t make much sense for Rivers’ camp to turn down his $13MM player option for next season. It’s hard to gauge Teodosic’s NBA value, considering he only played two games before falling to a foot injury. As things stand, the romantic notion that Teodosic would drop in from overseas to fill the playmaking hole left by Paul is on the back burner. If the plan was for Teodosic to prove himself in his rookie season, turn down his player option for 2018/19 and then sign a larger contract, it’ll come down to how he fares during the second half of the season, since nobody has yet seen enough to warrant a big investment. It seems likely that the Serbian 31-year-old will be back in the lineup before the end of December, so there’s plenty of time for him to prove himself at the NBA level. Over course of the last half decade, Williams has fully embraced an identity as a wildly prolific scorer off the bench. Over the course of the last two seasons alone he’s thrived in systems that have had no reason but to let him loose on their second unit and the volume shooter has shown no signs of slowing down north of 30. 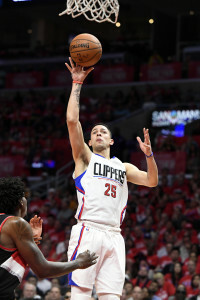 It may be a bit much to expect Williams to yield anything in the realm of former Clipper J.J. Redick‘s offseason haul ($23MM for a one-year deal with Philly) but there should be plenty of suitors willing to give 2015’s Sixth Man of the Year a sizable raise over his current $7MM salary. Player ages as of July 1, 2018. Photo courtesy of USA Today Sports Images. Rookie Jayson Tatum is looking even more effective in a free-flowing NBA offense than he did at Duke. Mike Schmidt of ESPN broke down the first-year forward’s impressive showing with the Celtics thus far, curious as to whether or not what he’s shown is sustainable. While Tatum has always been known to pull off acrobatic plays on offense, his ability to make quicker decisions and shoot reliably from beyond the arc has helped him thrive in the Celtics offense. Further, his improved defense has only added to his NBA stock. Credit Tatum for not trying to do much in his rookie campaign, perhaps that’s a benefit of landing in the rotation of a winning team fresh off an Eastern Conference Finals appearance. There are still areas where he could improve, however, including at and around the rim, where he currently falls in the 33rd percentile. While the Cavaliers may be the team to beat in the conference for now, the Celtics and Sixers are the future of the East, A. Sherrod Blakely of NBC Sports Boston writes. Both teams have impressive lineups as it but boast future assets that can help down the road as well. The Sixers have put themselves in an enviable position financially but eventually the day will come that the team has to start clearing contracts in order to pay their young players who are current under rookie contracts. Derek Bodner of The Athletic took a deep dive into the team’s long-term salary cap projections. After seven months of inactivity, Tony Parker made his return to the Spurs lineup this week and the veteran’s presence was quickly felt. As ESPN’s Michael Wright reports, Parker’s return boosted the squad on an emotional level. Parker followed up his debut in the Spurs’ Monday night victory over Dallas with a 10-point, five-assist showing on Wednesday. With an increased commitment to contributing in ways other than just scoring, Dwight Powell has found a way to ramp up his production for the Mavericks. As Eddie Sefko of the Dallas Morning News writes, the 26-year-old’s rebounds, steals and blocks are all up this season despite playing a similar amount of minutes. If the Mavericks are to ever become a coveted free agency destination, they’ll need to build themselves a young core, Kevin Sherrington of the Dallas Morning News writes. With Dennis Smith Jr. and Harrison Barnes, they’re off to a good start. The Pistons have trotted out Stanley Johnson as a starting small forward and have been pleased with the returns, Rod Beard of the Detroit News. While Johnson has done a fine job chipping in offensively, it’s with his defense that he’s justified the promotion. Johnson, Beard writes, is learning first-hand the highs and lows of the job. Being in the Pistons starting lineup means that he’ll have less of an obligation to initiate his own offense but will typically line up against opposing teams’ best forwards. Despite having seen just 36 minutes of action prior to the Bucks‘ last game, Jason Terry figures to become a bigger part of Milwaukee’s rotation, Matt Velasquez of the Journal Sentinel tweets. While many NBA players can be traded now, a huge chunk can’t be dealt until December 15, which is the default date for offseason signees to become trade-eligible. Our list of players who become eligible to be moved on December 15 features nearly 100 names, so any clubs eager to make a move could engage in more serious trade talks around mid-December. For players who signed contracts later in the offseason or who meet certain specific criteria, there are other dates to watch. Jason Terry (Bucks), Andrew Bogut (Lakers), Aaron Brooks (Timberwolves), Alex Len (Suns), Dante Cunningham (Pelicans), Bobby Brown (Rockets), and Dwyane Wade (Cavaliers) will all become trade-eligible between December 15 and the end of the month, while some other offseason signees can’t be dealt until January 15. Waiver claims are pretty rare in the NBA, since teams must have cap room, a trade exception, or a disabled player exception to claim any player earning more than the minimum salary. Still, it’s worth noting that on December 1, the waiver order changes, with the league using this year’s reverse standings instead of last year’s. That means that the Bulls, Hawks, and Mavericks are on track to move to the top of that list starting on Friday, supplanting the Nets, Suns, and Lakers. Most non-guaranteed salaries won’t become guaranteed until January, but there are a few specific dates to watch in December. Dorian Finney-Smith (Mavericks) will get a bump to his partial guarantee on December 5, while Luke Babbitt (Hawks) will have his full salary guaranteed for 2017/18 if he remains under contract through December 15. You can check out the full details right here. After the NFL gets Thanksgiving to itself in November, the NBA gets its showcase on Christmas Day, December 25. The highlight of this year’s schedule will be a rematch of last year’s Finals, as the Warriors play the Cavaliers in Oakland — that game gets even more interesting if Isaiah Thomas is back by then, which is a distinct possibility. However, there’s something to like about each of the other four matchups as well. A battle of young bigs will open the day, with Kristaps Porzingis‘ Knicks hosting Joel Embiid and the Sixers; the Wizards/Celtics rivalry will get its latest chapter in Boston; James Harden‘s Rockets will visit his former team, the Thunder; and the new-look Timberwolves will face the young Lakers in Los Angeles to wrap up the Christmas slate. Ross, acquired by the Magic last February in the trade that sent Serge Ibaka to Toronto, has been Orlando’s starting shooting guard for most of this season. However, his play had been up and down — Ross’ 9.0 PPG, .407 FG%, and .329 3PT% are all below his career averages. Although the Magic’s announcement said that Ross’ return date will depend on how his injury heals and how he responds to treatment, it’s probably safe to assume we won’t see him until sometime in 2018. A sprained MCL on its own generally takes several weeks to heal, and Ross also has to deal with a tibial plateau fracture — that injury affects the upper part of the shin bone, near the knee joint. Jonathon Simmons had moved into Orlando’s starting lineup this week and figures to continue to start at the two going forward. Evan Fournier, Arron Afflalo, and Mario Hezonja also may see more minutes while Ross remains out of action. Thursday marks the four-week point since the Cavaliers announced that Tristan Thompson would be sidelined for three or four weeks with a calf injury. And while Thompson isn’t quite ready to get back on the court yet, he’s getting close. According to Joe Vardon of Cleveland.com, the Cavaliers are eyeing next week for Thompson’s return. A team source tells Vardon that the Cavs want the veteran center – who last played on November 1 – to get a few more reps at practice before he’s activated. It will be interesting to see how the Cavs adjust their lineup to accommodate Thompson’s return. After starting all 78 games he played for the team last season, the 26-year-old started just five of eight games early this year, as the club tried to work out whether it made more sense to start him alongside Kevin Love or to start Love at center. If Thompson is re-inserted into the starting lineup, Jae Crowder figures to come off the bench, Vardon notes. With Thompson nearing a return to action, Channing Frye‘s spot in the Cavs’ rotation may be in jeopardy. However, Chris Fedor of Cleveland.com argues that Frye has earned consistent minutes with his play over the last couple weeks. The veteran sharpshooter is frequently mentioned as a possible trade chip, given his $7.4MM expiring contract, but he has been a solid role player during Cleveland’s current nine-game winning streak. The Cavs missed out on Paul George in the offseason, but Cleveland ought to be monitoring the George situation in Oklahoma City with the Thunder still struggling, says Sam Amico of AmicoHoops.net. In an ESPN.com piece examining the early MVP odds, Kevin Pelton writes that this looks like LeBron James‘ best shot at the award since his Heat days, particularly if he can sustain his current level of production. When Dion Waiters reached the open market back in July, the Knicks were cited as a potential suitor for him, though the free agent guard ultimately agreed to a long-term deal to return to the Heat. With the Heat and Knicks squaring off on Wednesday night for the first time this season, Waiters revisited his time as a free agent, confirming that New York did have have interest in him and made him an offer. Waiters acknowledged that the appeal of playing in New York City and the proximity to his hometown (Philadelphia) and college (Syracuse) had him intrigued by the possibility of playing for the Knicks. However, his preference was always to stick with the Heat if that was viable. “Other teams figured that’s how it was going to be,” Waiters added. After a year of stability in the head coaching ranks, two coaches have already been fired this season and others are finding themselves on the hot seat. However, Raptors head coach Dwane Casey, whose job security has looked shaky at times in the past, seems pretty safe right now, says Doug Smith of The Toronto Star. Brian Lewis of The New York Post takes a closer look at the development of second-year guard Isaiah Whitehead, who has frequently bounced back and forth this season between the Nets and their G League affiliate. If Whitehead can cut down on his turnovers, he should continue to see more time in Brooklyn than in Long Island, writes Lewis. Speaking of the G League, the Sixers‘ affiliate, the Delaware 87ers, will be getting a brand new home for the 2018/19 season. Jessica Camerato of NBC Sports Philadelphia has the details on the 76ers Fieldhouse, the multi-purpose sports complex in Wilmington, Delaware which will hold about 2,500 fans for G League games. The most common tool over-the-cap teams use to sign free agents from other teams is the mid-level exception, but that’s not the only exception those clubs have to squeeze an extra player onto the payroll. The bi-annual exception is a way for a team to sign a player who may command more than the minimum salary, but less than the mid-level. As its name suggests, the bi-annual exception can only be used every other season. Even if a team uses only a portion of the exception, it’s off-limits during the following league year. The bi-annual exception is available only to a limited number of clubs, even among those that didn’t use the exception during the previous season. Teams that create and use cap space forfeit the BAE, along with all but the smallest version of the mid-level (the room exception). Additionally, teams lose access to the bi-annual exception when they go more than $6MM over the tax threshold, exceeding what’s known as the tax apron. So, only teams over the cap but under the tax apron can use the BAE. If a team uses all or part of the bi-annual exception, it triggers a hard cap for that season. Clubs that sign a player using the BAE can later go under the cap, but can’t go over the tax apron at any time during the season once the contract is signed. The bi-annual exception allows for a starting salary of up to $3.29MM in 2017/18. Under the NBA’s previous Collective Bargaining Agreement, the value of each season’s bi-annual exception was determined in advance. However, under the 2017 CBA, the value of the BAE in future league years will be tied to salary cap increases. If the cap goes up by 5%, the value of the bi-annual exception will also increase by 5%. A player who signs a contract using the bi-annual exception is eligible for a one- or two-year deal, with a raise of 5% for the second season. For players who signed using the BAE in 2017/18, the maximum value of a two-year contract was $6,744,500. Teams also have the option of splitting the bi-annual exception among multiple players, though that happens much less frequently than it does with the mid-level exception, since a split bi-annual deal may not even be worth more than a veteran’s minimum salary. The bi-annual exception starts to prorate on January 10, decreasing in value by 1/177th each day until the end of the regular season. During the 2017/18 league year, the Clippers were ineligible to use the bi-annual exception, since they used it to sign Luc Mbah a Moute in 2016/17. Three teams have used the BAE this season, with the Grizzlies signing Tyreke Evans, the Rockets signing Tarik Black, and the Pistons signing Anthony Tolliver. Those three clubs won’t have the exception at their disposal during the 2018/19 league year. Several teams, including the Spurs, Bucks, Pelicans, and Raptors, remain eligible to use the bi-annual exception this season, but if they don’t take advantage of that opportunity, they’ll retain their eligibility to use it in ’18/19.